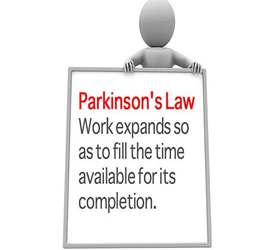 Parkinson’s Law – Work expands to fill the time available to complete it. If you’ve spent any sort of time reading about productivity, you’ve probably run across Parkinson’s Law before. You might know the name or concept, but you may not know exactly it is or how you can implement this law to be as effective as possible. Unfortunately, very few people will actually tell you to work less. Even fewer people will force you to work less. That means that if you’re going to implement Parkinson’s Law, you’re going to have to do it yourself. Systematically chop your tasks into chunks, and force yourself to set a specific timetable for accomplishing them. Restrict your time artificially by moving throughout the day. Force yourself to move every two hours, and create a set task list. Blackmail yourself.Get an accountability partner who will force you to pay up, literally, if you work past a certain time or take too long to something. In addition to enjoying the mental victories, if you use this approach, you’ll be motivated by real consequences. Set a hard deadline. Set a specific goal for the end of that length of time, and set it in stone. Have something planned to motivate you to hit your goals. Limit tasks like responding to email to thirty minutes a day. Instead of agonising over each email, spend thirty minutes on your emails at the end of the day and be done with it. You’ll find that smaller tasks take up much less time this way.